At a packed Siri Auditorium in New Delhi, LeEco, formerly Letv have launched Le 2 and LeMax 2 smartphones in India at the 2Future event. The two smartphones will go on sale exclusively on Flipkart and the new LeMall website. The registrations for the 28th June flash sale will begin on 20th June. Prices of Le 2 and Le Max 2 begin at Rs. 11,999 and Rs. 22,999 respectively. 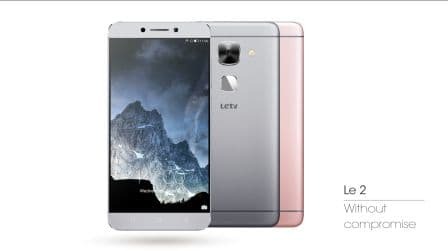 After the success of the Le 1S Eco, the team at LeEco is confident that the new smartphones that were launched two months ago in China will be a success in India as well. The team has made some changes in the innards of the smartphones by replacing MediaTek chipsets with Qualcomm Snapdragon chipsets. Let us what else is new in these smartphones by discussing them one by one starting with the cheaper Le 2 smartphone. The Le 2 smartphone sports a 5.5inch display with full HD (1920 x 1080 pixels) resolution display with pixel density of 403ppi. Underneath the hood we find a Qualcomm Snapdragon 652 chipset that houses a 1.8GHz 64-bit octa-core processor and 3GB of LPDDR3 RAM that is capable enough to run the Android Marshmallow based EUI 5.6 operating system. The Le 2 has an internal memory of 32GB and is devoid of microSD card slot to expand memory. The rear primary camera of the Le2 has a resolution of 16MP and comes with dual-tone flash and back-illuminated CMOS sensor. The front secondary camera has a resolution of 8 MP and features a wide angle lens. Le 2 features fingerprint sensor and infrared remote control feature along with the usual list of sensors. The Le 2 supports Continual Digital Lossless Audio with the help of its USB Type C connector which serves as the earphone connector as well. This seems they have miffed Apple with this move. The Le 2 is powered by a 3000mAh battery. 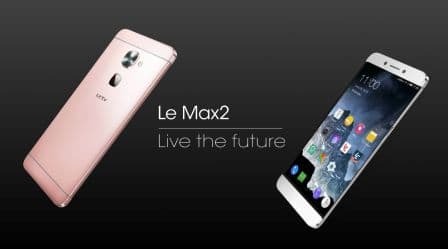 The Le Max 2 is the more expensive of the two and it comes with specs that justify the Rs. 23K price tag. The Le Max 2 as the name suggests has a bigger 5.7inch 2K (2560 x 1440 pixels) resolution display with a pixel density of 515ppi. Underneath the hood we have the Qualcomm Snapdragon 820 chipset that houses a 2.15GHz 64-bit quad-core processor with 4 or 6GB of RAM. There shall be two variants of the Le Max 2, one with 4GB RAM and 32GB internal memory and the other with 6GB RAM and 64GB internal memory. Both of the handsets are devoid of microSD card slot. The primary camera on the Le Max 2 has a resolution of 21MP and it comes with enhancements like Optical Image Stabilisation, dual tone LED flash and dual HDR. The front camera has a resolution of 8MP. Like the Le 2 this one too features fingerprint sensor and infrared remote control. The Le Max 2 is powered by 3100mAh battery. Since LeEco has ditched the regular 3.5mm headphone jack it has provided an earphone jack to fit the USB Type C port and make your headphone compatible with these phones. If you feel generous though you can buy world’s first CDLA audio compatible USB Type C jack earphones for Rs. 1990.